What is the path to building great products? It starts with strong communication between product, engineering, sales, and support teams. Every team deserves a purpose-built tool — but not at the expense of effective communication and collaboration. This is why we are committed to improving the way Aha! integrates with the tools you rely on most. We have been working for months to redefine what is possible with our integrations for development tools so you can seamlessly integrate Aha! with tools like Jira. 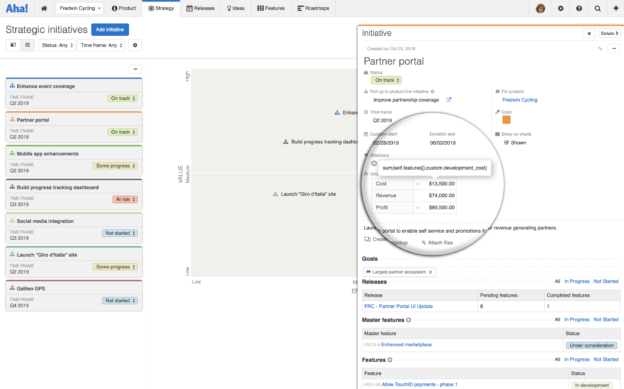 The result is our new second-generation integrations framework, which provides the most flexible and comprehensive integration capability between product roadmapping software and dev systems ever available. Our powerful new integrations create a bidirectional link between Aha! and development tools, with custom options for linking the fields in both systems. But before I get into the details of what is new, let’s take a step back to understand how this update fits into our overall integrations strategy and what it means to you. For example, Aha! acts as a message broker when integrating with communication tools. Pre-built plug-ins are available to send ideas to Aha! from other customer relationship management systems, such as Zendesk and Salesforce. We have a framework in place for single sign-on systems and securely connect with third-party file storage services. Our robust API makes it possible to both import data into Aha! from your internally-built tools and to export data from Aha! for analysis and reporting purposes. And all these integrations are available to you at no additional cost. The new integrations framework is unique in that it dramatically improves how Aha! 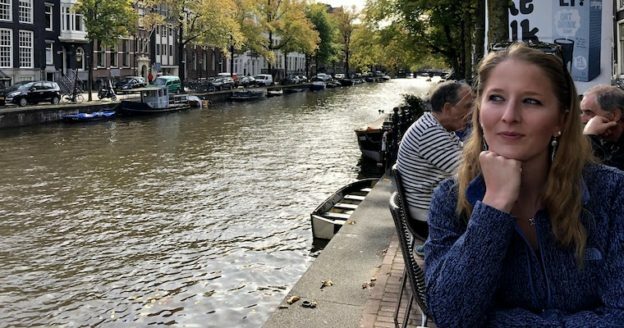 can connect with development tools — in this case, how Aha! connects with Jira. It is purpose-built for integrating with the tools that engineering teams use to track their work. Set record mappings for Aha! initiatives, releases, master features, features, and requirements and link them to nearly any corresponding record type. Map default or custom fields in Aha! to any “like” field and specify which direction the updates should flow (e.g. from Aha! or from the development system). Automatically send outgoing changes from Aha! or choose to review and approve them. Import records directly from development tools to make getting started in Aha! easy. These enhancements give you more flexibility to communicate changes, collaborate on requirements, and track progress throughout the development process. And you now have deep customization options so you can configure your integration to reflect exactly the way your team works. If you already have an Aha! integration set up with Jira, you can create a new one using the Jira link that is listed in Aha! under integrations 2.0 or convert your existing integration from 1.0 to 2.0. You can also continue to use your 1.0 integration. Note that to benefit from the new functionality, you will need to set up a new Aha! integration with Jira or convert your existing integration. You now have full control over which record types will be sent to your development tool and how those records will map. For example, you can now choose to have master features in Aha! correspond with epics or similar items in Jira. You can also map Aha! initiatives, releases, features, and requirements to reflect the way you organize and break down work. As work is completed, feature status and other updates in Jira will automatically sync back to Aha! based on your configuration. Define the exact fields you wish to sync for each record type as well as the direction of updates. For example, you can communicate the product team’s priorities by syncing the Aha! feature position (or rank order) field with a custom field used by your engineering team in their development tool. You can even set this field to sync only when it is initially sent so your engineering team can then organize their work the way they need to without affecting the rank in Aha! Set the direction to synchronize bidirectionally or unidirectionally. When the engineering team begins work on a feature, it is not unusual for new requirements to be added as work progresses. Now, when engineering creates new features or requirements in Jira, those records are collected in an “Integration updates” queue in Aha! for you to quickly review and determine if you want to import. Integration updates can be filtered by product name, record type, or specific integration. You also have the ability to import existing records into Aha! from Jira. This makes it possible to quickly build a roadmap in Aha! using releases, features, and requirements already defined in Jira. Once imported, the Aha! integration automatically creates a link between the records so that both systems stay in sync as you make changes. 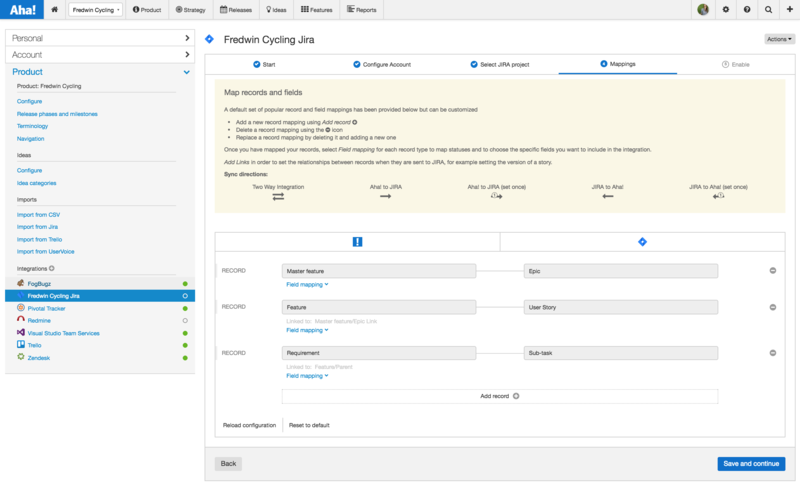 You control which record types to import from Jira to Aha! You can now set up your integration to work the way you want it to and be confident that everyone sees the right information — in the right system and at the right time. 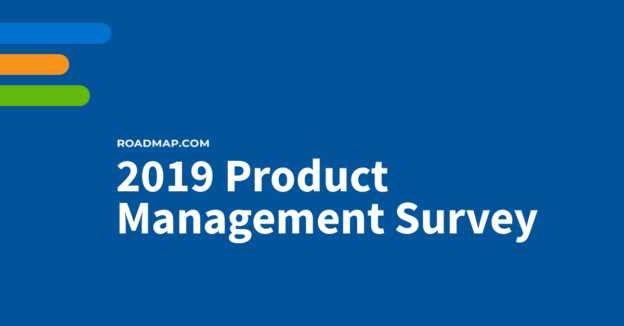 These enhancements provide you with the most robust integration between a product roadmapping software and a development tool available. Try out the enhanced Aha! integration with Jira and let us know what you think. We will be quickly building on the new integrations framework to rapidly roll out additional development tool integrations. Look for good news for Rally users next week! 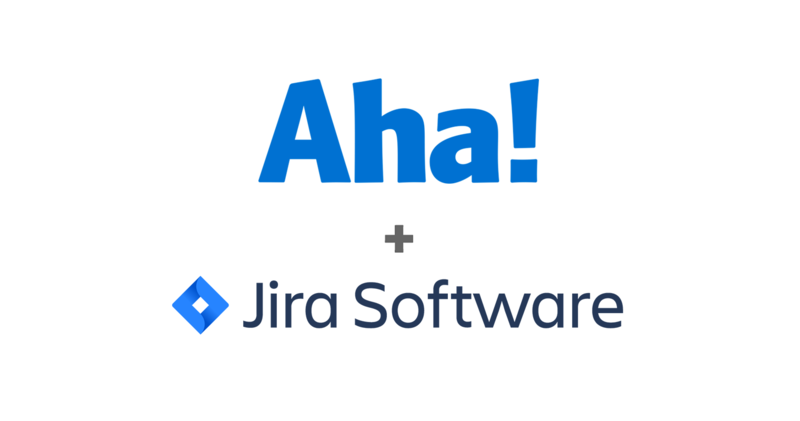 The enhanced Jira integration is available to all Aha! customers. If you are not already an Aha! customer, you may want to sign up for a free 30-day trial of Aha! now to see why over 150,000 users trust Aha! to set product strategy, create visual roadmaps, and prioritize releases and features. Aha! is a trademark of Aha! Labs Inc. All other company and product names may be trademarks of the respective companies with which they are associated. Jessica is passionate about showing product managers there is a better way. She is the Product Marketing Manager at Aha! 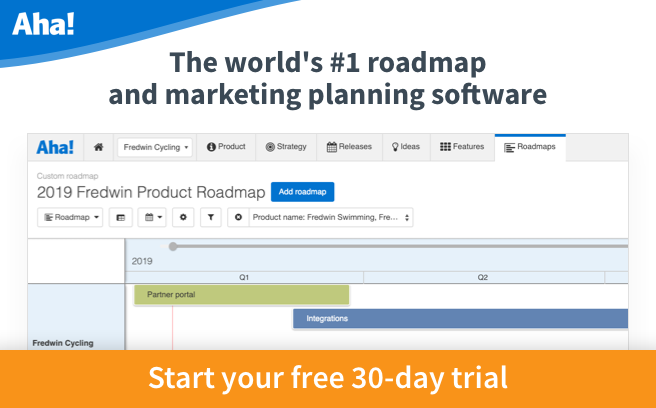 — the world’s #1 product roadmap and marketing planning software. Previously she led product at YouEarnedIt, a top five employee engagement platform. Before that she was a product marketing manager at several business-to-business SaaS companies. I’ve been waiting for this! Awesome!! We currently use the JIRA Connect integration because our JIRA instance has 2FA which Aha’s standard JIRA integration doesn’t support. Any plans to support this in future so we can use the better integration? Good news, that is already possible! When you go to add a new integration, you will see Jira via Connect in the Integrations 2.0 section. If you have already setup the plugin in Jira, then all you will need to do is follow the steps to set up the integration in Aha! and you will be ready to go. If you need any assistance, send us a note at support@aha.io. Our team of former product managers will be happy to help. Yay! We can for sure benefit from the revised JIRA mapping approach options! Thanks. Amazing as always! I love you guys so much that my company is getting a little bit tired of my fan girl antics. I won’t stop singing your praises though! This is great. Will there be Trello 2.0 integration? Good news Daniel! There will be a Trello 2.0 integration in the future. We will be moving all of the development systems over to integrations 2.0 based on the number of customers using them. You can vote on this idea to receive Trello integration updates. This is a big improvement. Does the integration update notify either way with deleted requirements? Either deleted from Aha or deleted as a sub-task in Jira? Thanks, we think it is a big improvement too! The Aha!-Jira integration will never delete issues or features. This is an intentional design to prohibit accidental deletes from happening. When a linked record in Aha! is deleted, there is a prominent message telling the user the issue must also be deleted in Jira. If you are interested in sharing your support for some type of additional notification, you can vote on this idea in our ideas portal. Is this integration available for Jira Server or for Jira Cloud only? This is available for both the cloud and on premise versions of Jira. We are actively working on an update which will provide the ability to “link to existing” records for 2.0 integrations. Please vote on this idea to be notified when that ships.